"Give me two children, not younger than ten years old." "Get us one that looks healthier." These words might have been spoken in every state between 1854 and 1929 when more than 250,000 orphaned children arrived on trains from New York to points throughout the United States. Most were taken to the Midwest rural areas and put on display at the train stations. They were dressed in new clothes, told to be on their best behavior, and speak only when spoken to. Someone might adopt them, they were told, or they might not. I visited the National Orphan Train Complex and Museum in Concordia, Kansas, to learn about some of these sad and happy stories of children suffering and children rescued. Good use of my time! Mass immigration from Europe into New York's Ellis Island in the earlier 1800s met head on with limited employment possibilities. Too many new people in the United States too quickly with not enough jobs available set up an imbalance for survival. Breadwinners could not support their families. Parents became sick; some died. Children were left to fend for themselves. Many aimlessly roamed the streets of New York, searching for food and a place to sleep. Charles Loring Brace asked why so many homeless children filled the streets, and when he found the answer, he did something about it. 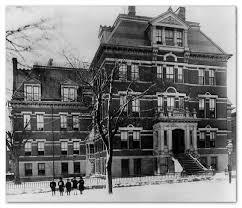 He opened what became the Children's Aid Society in 1853. He provided education and employment training, but soon realized that the children needed more. He housed them, fed them, and taught them social skills. But he still wasn't satisfied. That's when he used trains to transport them to the Midwest to seek families for them. He published notices in newspapers about arrival times. Prospective parents were told to show up and claim a child. Most of these random matches worked well for both parents and children. Some did not, but the Children's Aid Society made yearly visits to check on the children's welfare and make changes when necessary. Mary Ellen Johnson learned about this endeavor and began researching stories and finding surviving orphans. Seventeen years later, in 1986, she created the Orphan Train Heritage Society of America. 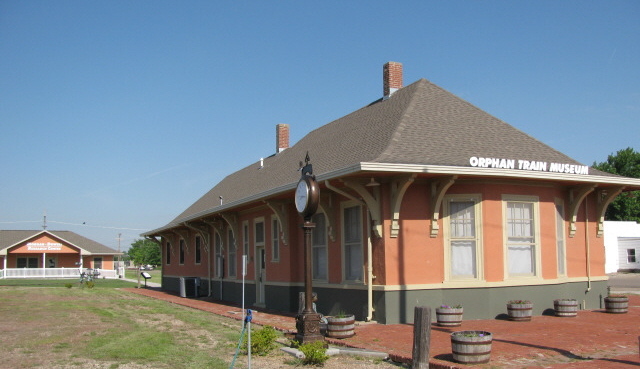 The National Orphan Train Complex in Concordia serves as a research center. This museum profiles many orphans, sharing their life histories. A few of them are still living and are invited to an annual celebration each June. Stories are told, tears are shed, and new relationships develop. Children's Aid Society building in New York City, begun by Charles Loring Brace in 1853 to house homeless immigrant children. Researchers tell us that one in twenty-five Americans, anywhere in the country, will have some connection with an orphan train rider. This was true for me. An attorney in the town where I grew up was an orphan train rider. Want to learn more about the orphan train riders? Eve Bunting wrote a picture book called Train to Somewhere. Highly recommended.